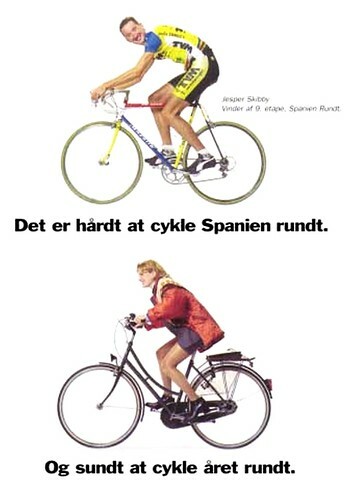 This Danish advert promoting everyday cycling is from 1995. It's interesting from a marketing perspective and not a little rare. Usually well-known racing cyclists are enlisted to sell 'gear' and cycling as a sport. This advert features the Danish racing cyclist Jesper Skibby. By the way, he's the only Dane and one of few professional cyclists to have won stages in the Big Three - Giro d'Italia, Tour de France and the Vuelta a Espana. In Danish the Vuelta is called Spanien Rundt, or All Around Spain. "It's hard to ride all around Spain [hard to ride the Vuelta is what that means]"
"And healthy to ride all year round"
Next to Jesper is the text "Jesper Skibby, winner of the 9th stage of the Vuelta a Espana". I like the way that a racing cyclist and an everyday cyclist - in the form of the iconic Cycling Girl so well known in Danish history - are presented as equals. As though they each can inspire each other and they are both hardy and deserve respect. A refreshing lack of elitism.